If you have a lot of data to print, there is no way you can fit it on one page. But there are situations when some columns or some rows are printed on separate sheets if the data is printed at 100% size. In this case, you can try to fit additional data on one sheet. If you want to test this example, you can download a sample data for free from Brian Dunning’s site. You can download it, modify and practice. I use a header and sixty rows of data which I try to fit on one page. If you want to check how your data looks like go to File >> Print or use Ctrl + P.
As you can see, there are only 4 columns out of 9. 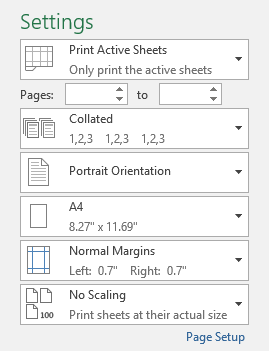 If you look to the bottom-left of the print preview, there is the current page number and the total number of pages to print. 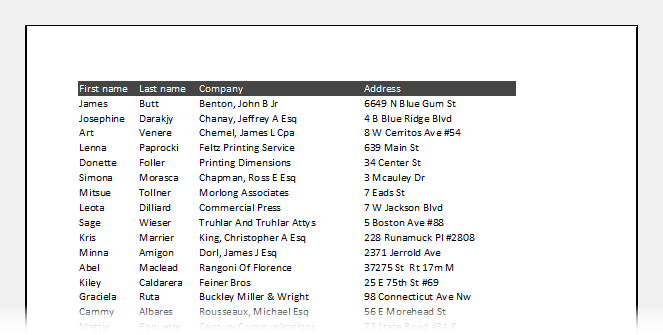 If you click the next pages you will notice, that rows are printed on two pages and columns are printed on two pages. In total it gives us for, which will result in a total waste of paper and it would be hard to read. In order to deal with this, let’s find out what we can do in order to fit it on one page and at the same time make it look good. When you are in the Print area, there are some options you can tweak to achieve our goal. Orientation – By default, the page is oriented in the Portrait Mode. If you have a lot of columns inside your worksheet, it’s a good idea to change it into Landscape Mode. But in our example, we will keep it with the default portrait mode position. Scaling – The default, No Scaling option will display data in 100% size, which is not good in our example. If you choose Fit All Rows on One Page it still won’t work as desired because some columns will be displayed on the second page. Now, you can click Page Setup to see how much smaller the text is. It’s 83% of the normal size. We have still to pages and we need to fit it into one. All rows are inside a page, but there are some columns that will be printed on the second one. The best option for this data will be Fit All Columns on One Page. The data is displayed on one page, but the font is quite small. Let’s see how much smaller it is. 65% is quite small. We can make this number larger by adjusting margins. Currently, the margins are set to normal. Change it to Narrow Margins. These margins are the smallest you can get on the normal printer. The one more thing, you can do is to remove or hide some columns. It’s especially effective if your column is very wide. If the column is not necessary, just hide it. The font will be bigger, making the print look better.